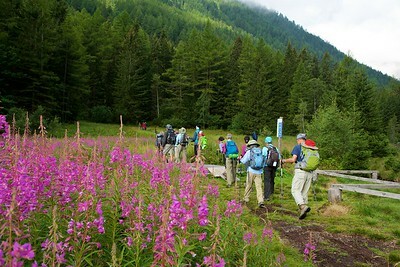 Our final four days of hiking on the Tour du Mont Blanc take us from Champex, Switzerland, back to Chamonix, France. 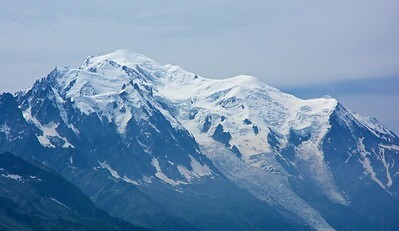 The weather is improving, and we finally have truly spectacular views of the Mont Blanc massif with it’s imposing needle-like spires and many glaciers. We also have a chance to see some unexpected wildlife. 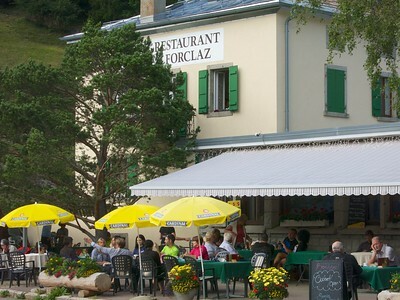 On the morning of our 8th TMB hiking day, Marry, Jim, Sue and Rachel are waiting in front of the Hotel du Glacier for the troops to gather. 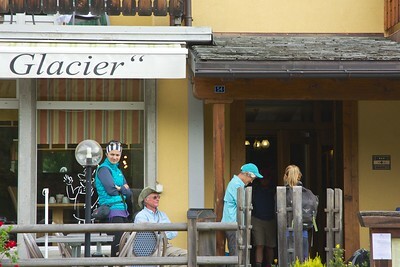 This was a terrific hotel, great rooms, run by the same Swiss family for generations. 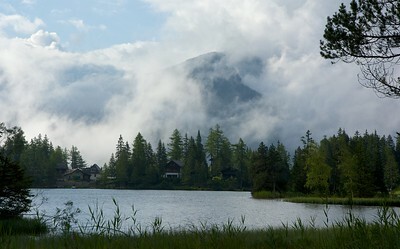 Our hike out of Champex took us along the lovely lake the town is built around. 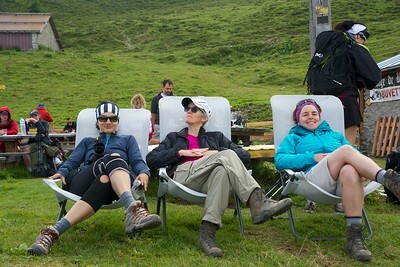 Laura and Heather are enjoying their mid-morning cappuccino. A little sun, a nice view, what more could you want? 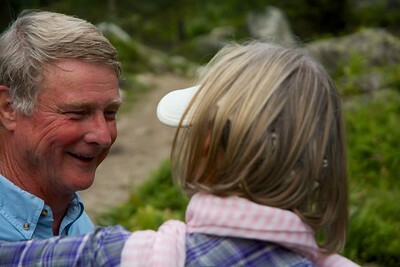 Jim is very happy, because Marie-Guislane is handing out chocolate! We took a "detour" today, to avoid some more crowded sections of the TMB. 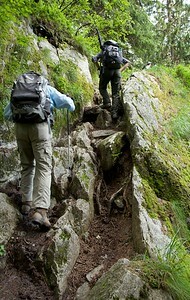 This did, however, make for some rougher trails! Jim and Sho are negotiating a very rocky bit of "trail"
Jagged peaks above the valley we've just climbed out of; and the clouds have moved back in. 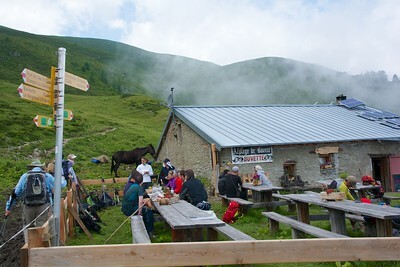 We stopped for lunch at Alpage de Bovine. 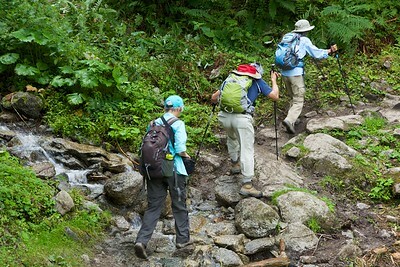 This section of the TMB is known as the Bovine Way. Inside the Alp Bovine, Brett is making a purchase. 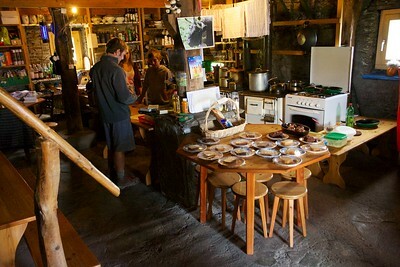 There are plenty of pastries and hot drinks available. And the family lives in this ancient building during the summer season! 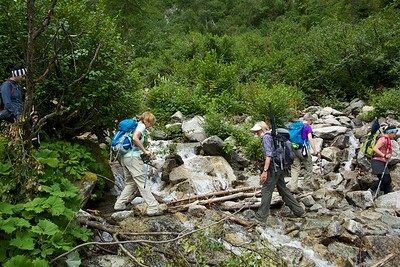 Outside the Alp Bovine, Marry, Heather and Wendy are taking a nice after lunch break from hiking. 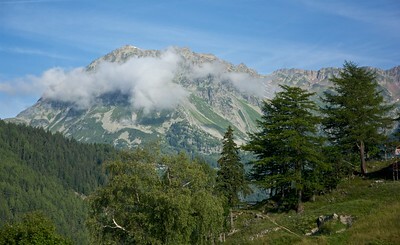 Our destination today, Col de la Forclaz. Our group is gathering for a drink on the patio before dinner. 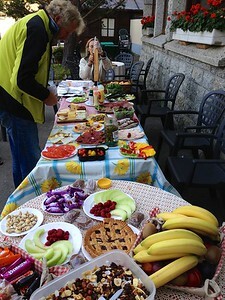 TMB day 9 lunch buffet. Every morning, Mike put out a gourmet spread for us to select our lunch items from. 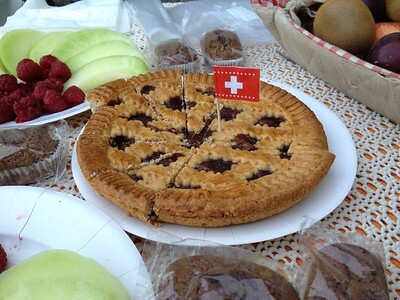 You can tell from the flag on the tart, we're in Switzerland. 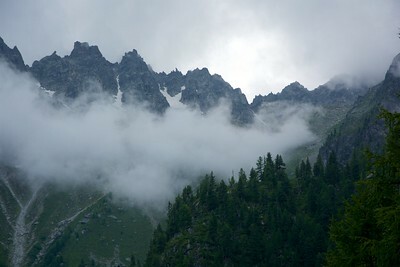 Leaving Col de la Forclaz, the weather today is promising. 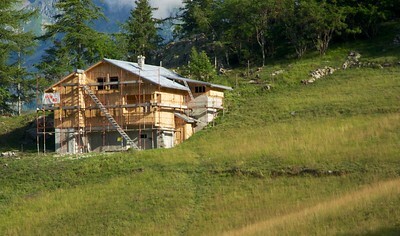 We were told that this conventional-looking building is actually a bomb shelter; the Swiss hide them behind a facade that looks like a normal house. 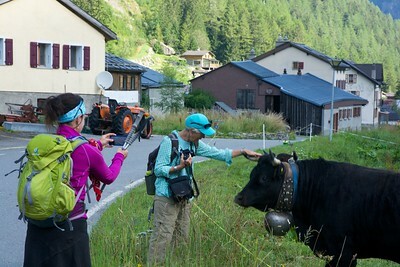 After a steep descent from Col de la Forclaz, Sue and Laura are making friends with the local inhabitants. 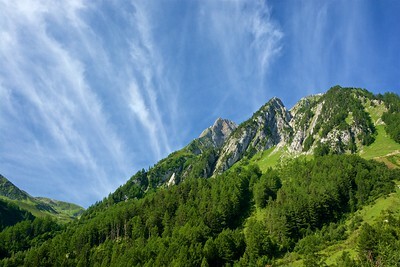 Now that we are in the valley, we will hike over the next ridge. We're again above timberline, and the views are great. 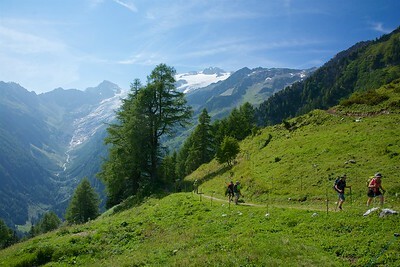 I believe that is the Glacier du Trient falling into the valley, and Glacier des Grands near the mountain top. Coming around the ridge, though high clouds have moved in, we get our first view of the entire trip of the summit of Mont Blanc, 4,810 m (15,781 ft), with Dôme du Goûter to its right.